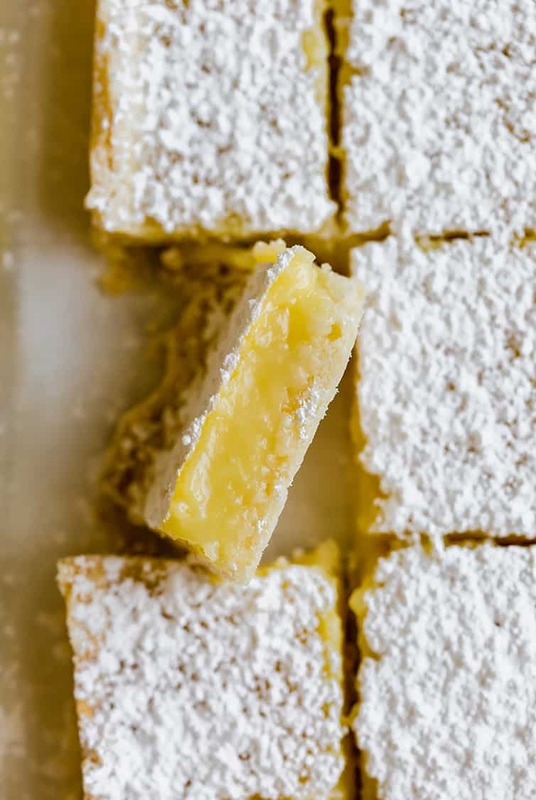 These easy lemon bars start with a shortbread-style crust and have a silky smooth, slightly tart, sweet lemon custard on top. All they need is a dusting of powdered sugar! The perfect recipe for your next picnic, holiday tray or wedding cookie table. I am admittedly not a huge lemon dessert type of person. A wedge lemon in my water or iced tea? Sure! But lemon for dessert when I could choose something like chocolate or cheesecake? It’s a hard sell for me. 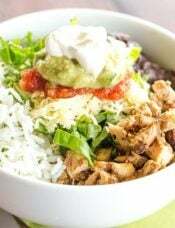 That being said, there are times, especially in the summer, when I’m just craving something super light and refreshing to top off a meal instead of something crazy sweet and heavy. Enter lemon bars. 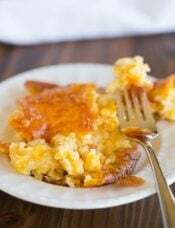 I first tackled this recipe nearly 10 years ago when my sister would rave about the lemon bars that always appeared on her friend’s mom’s holiday cookie trays. 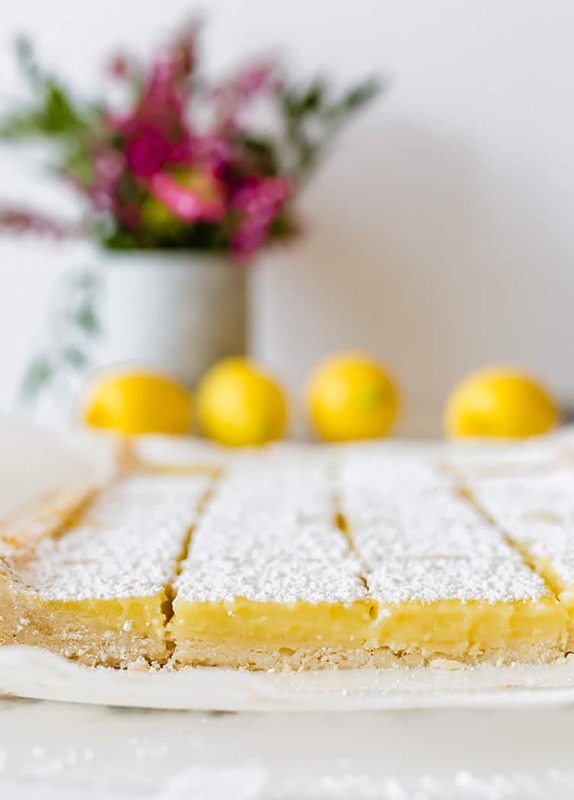 Until then, a lemon bar had never passed my lips, so I set out on trying some different recipes and this one emerged as not only the best, but the easiest by far! The shortbread crust is surprisingly soft (thank you, cornstarch!) and the lemon filling is the perfect hybrid of creamy yet firm and tart yet sweet. Are Lemon Bars Supposed to be Refrigerated or Stored at Room Temperature? 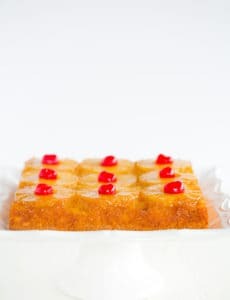 Since lemon bars are essentially a custard, they should be refrigerated if they are not going to be served the same day, or if you need to store leftovers. However, they are fine to keep out at room temperature for a number of hours if they are on a serving platter at a party, for example. You can serve them cold from the refrigerator or at room temperature. Can Lemon Bars Be Made Ahead? Yes, you can make lemon bars up to two days in advance. 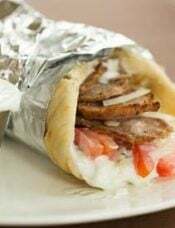 Simply allow them to cool to room temperature and then cover tightly with plastic wrap and refrigerate. 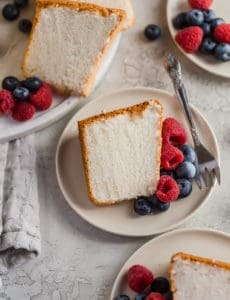 Once you are ready to serve, I suggest bringing them to room temperature and/or blotting the top with a paper towel to remove any condensation that developed in the refrigerator before dusting with powdered sugar. If you don’t, then the powdered sugar will dissolve into the condensation pretty quickly. Can Lemon Bars Be Frozen? Bake the lemon bars as directed and allow them to cool. Before slicing, you can wrap tightly in plastic wrap, then foil and freeze for up to 1 month. Bake and slice the lemon bars as directed. 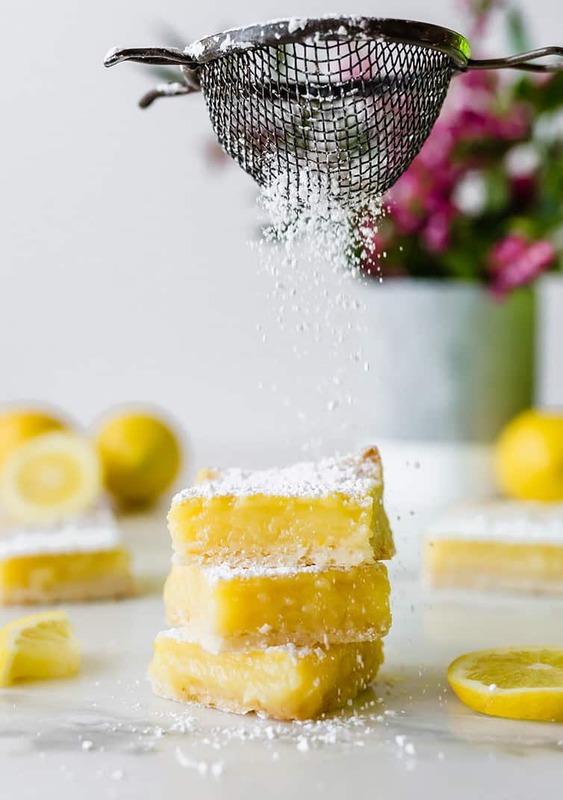 To freeze individual lemon bars, place them on a rimmed baking sheet with a couple inches of space around each and place in the freezer until the bars are frozen, about two hours. Then wrap each bar individually in plastic wrap and place in a resealable freezer bag. They will keep in the freezer for up to 2 months. Whether you plan to make these for a picnic in the middle of summer, a cookie table for a wedding in the spring, or a Christmas cookie tray, you’ll be so pleased with how easily these come together and how delicious they are. Shower them with a generous dusting of powdered sugar and they’ll be ready to go! Classic Lemon Bars with a shortbread-style crust and silky smooth, slightly tart, sweet lemon custard on top. All they need is a dusting of powdered sugar! Preheat oven to 350 degrees F. Lightly butter a 9x13-inch baking pan and line with parchment paper. 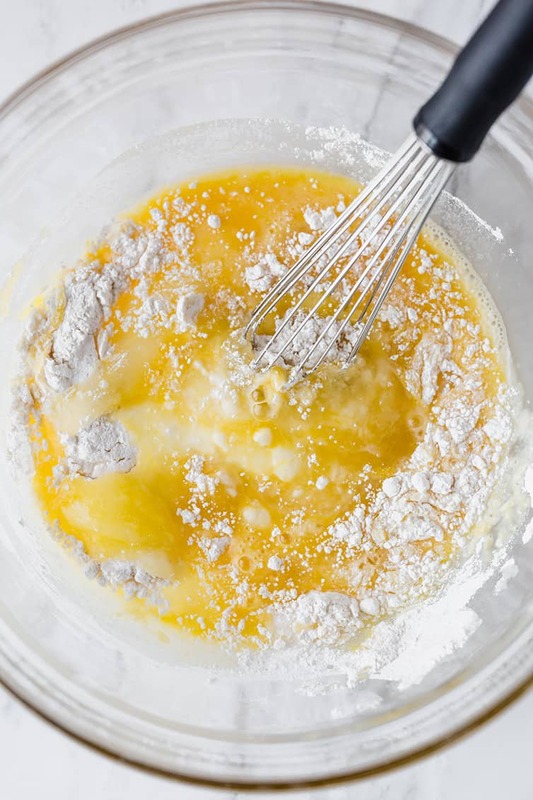 Make the Crust: Pulse flour, powdered sugar, cornstarch, and salt in a food processor. Add the butter and process for 8 to 10 seconds and then pulse until the mixture is pale yellow and resembles coarse meal, about three 1-second pulses. Sprinkle the mixture into the lined pan and press firmly into an even layer over the entire pan bottom and ½-inch up the sides. 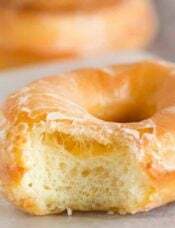 Refrigerate for 30 minutes, then bake until golden brown, about 20 minutes. 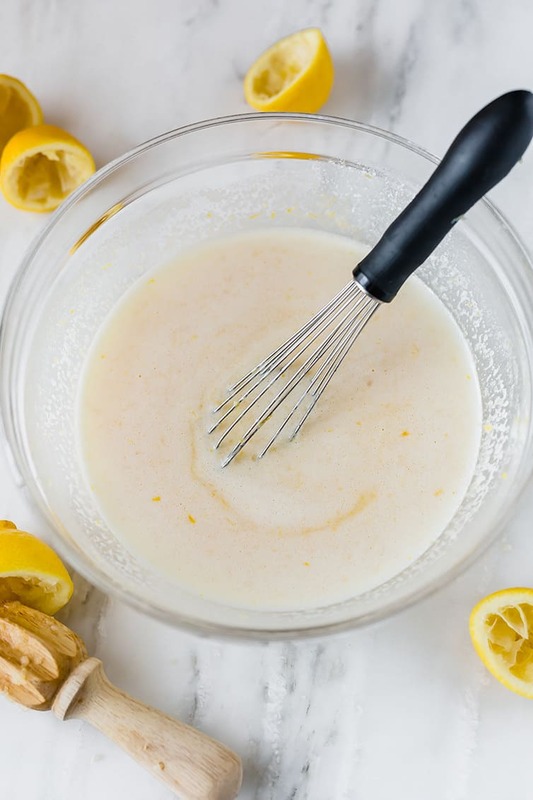 Make the Filling: Meanwhile, whisk the eggs, sugar and flour in a medium bowl, then stir in the lemon zest, lemon juice, milk and salt to blend well. Reduce the oven temperature to 325 degrees F. Stir the filling mixture to reincorporate the ingredients, then pour into the warm crust. Bake until the filling feels firm when touched lightly, about 20 minutes. Transfer the pan to a wire rack; cool to near room temperature, at least 30 minutes. Lift the bars from the pan using the parchment paper, then place on a cutting board to slice into squares. Sift powdered sugar over bars, if desired. Leftover bars can be covered in plastic wrap and refrigerated for up to 2 days. You can prepare the crust by hand simply by whisking together the flour, powdered sugar, cornstarch, and salt. Then, cut in the butter with a pastry blender (or grate frozen butter into the mixture and rub together quickly with your fingers) until completely incorporated and resembles coarse meal. 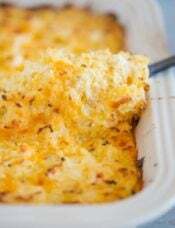 The filling needs to be poured into a warm crust straight from the oven, so once the crust is in the refrigerator chilling, prepare the filling so it's ready when the crust comes out of the oven. This recipe was originally published on August 24, 2010. Made these this morning before church. Cut in to sample while fixing Easter dinner. Prepared exactly as written and they are fantastic! I may have to share them. Thanks. Nice lemony flavor and great crust, but the filling was watery. Any idea why? Also, I got a thin white film on the top which didn’t matter once I sifted the powdered sugar on top, but was wondering. Thanks! can you tell me if these freeze well? Thank you. Yes, you can freeze them up to 1 month! I don’t have a food processor. Could I use a blender? Hi Christye, Yes that should work just fine! Made these for a couple of caterings, and got rave reviews. The first time I did them, my sister helped but forgot to add the flour to the filling, so they took a little longer to bake but still tasted wonderful. The second time I made it without help (lol), and the bars were a little more firm. People who said they had never really liked lemon bars gave it a two-thumbs-up review. The little bit of milk in the filling gives it a creamy texture that is similar to lemon curd, but without all the expense and work of making a curd filling! This is now my go-to recipe. Thanks!!! I have used your refrigerator bread and butter pickle recipe many times (just made another batch) and they are excellent. Going to do the lemon bars too. I really appreciate the detail you give and all the tips for each of your recipes. Like suggesting blotting the lemon bars after they been refrigerated. Very helpful. Thank you for the incredibly kind comment, Fredi. It’s wonderful to know you find the recipes helpful! These are my ‘farewell-to-summer’ treats. This is a fantastic recipe. So good. I absolutely love the lemon and sweet combo. And I love the addition of powder sugar on the top! I love trying new dessert recipes. 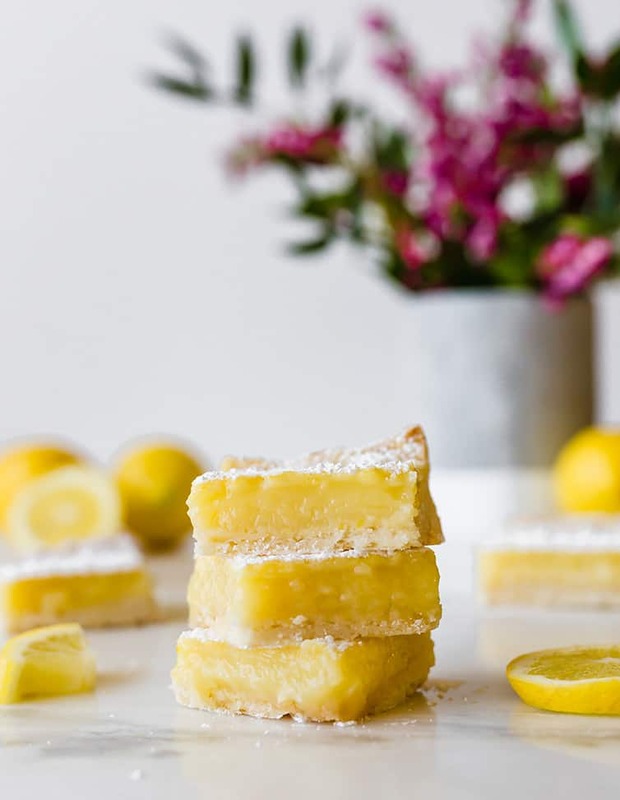 I will be making these lemon bars, they look delicious. I made these yesterday and they are really, really good. They are easy to make and its not like the ones my sister use to make with a boxed mix. The lemon comes thru nicely. These will go with my list of must make again “bar recipes”. Thanks!! I have a powdered sugar solution! King Arthur Flour has a non melting powered sugar. 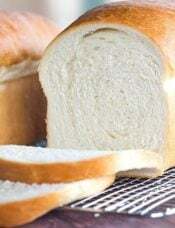 I used it when I had my bakery (my supplier also had a generic). You will never use anything else!! I love your blog, and your children are beautiful! Oh my gosh, thank you for the tip, I had no idea something like that existed!! Just made these and a thin white film formed over the top. Do you know why that happened??? Hi Darci, Do you mean immediately after baking, or after they sat for awhile? The powdered sugar will eventually dissolve into the top of the bars if left to sit out, so that could be it. If it happened immediately after baking, I’m not sure why that would happen. Hi does 1-1/3 cups granulated sugar mean 1 and 1/3 cups of sugar? Hi Nova, Yes, sorry for the formatting issue. I’ve had the same problem twice when making lemon bars. I’m using the parchment paper and somehow the filling is getting underneath the crust?! It makes it a mess. Any help on why this is happening? Anne- Are you building the crust up along the edge? That would be my first thought. Press the crust down good on the bottom and build up about the length of a fingernail (the bed part, not to include the free edge). The other thing to check is buttering the parchment paper. Using a whole stick I rub it all over the pan, rub it onto the first layer of paper & press it down to seal the edges. I repeat the process on the second layer of paper that goes cross-wise to the first. Could I use 2% milk without messing up the recipe? That is all I have and want to make these today! Hi Jody, Whole milk is best when working with custards, as it ensures a thick final product. You can try the 2%, but might find that the custard is a little thin. I make lemon bars and while they taste great, I have a couple questions. Your recipe calls for milk, doesn’t that cut the tartness of the lemon? Also, a couple of times the filling has had a cratered type look to it after its baked. Do you know what would cause that? Thanks! Hi Anne, Yes, the milk does cut the tartness a bit, which creates a nice balance of flavor; it also helps to achieve the creamy texture. As for the craters, that could be due to some air pockets. My most favorite lemon bars recipe so far is from Ina Garten, but I reduce the sugar in the filling to 2 1/2 cups. 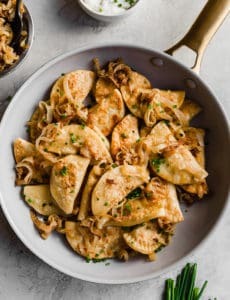 I am always searching for even better, so I made your recipe today. They were very tasty, had a strong lemon flavor, and were not too sweet. I liked the crust because it was a bit thinner and a little bit more delicate. My crust did not brown as you have pictured above (and maybe that is why it seemed delicate?). I followed your directions exactly. I cooked them in a glass pan. Do you have any suggestions? Perhaps I should try again without the parchment? Either way, I think that I now have two favorite recipes. Okay. I now see the problem. After 20 minutes my crust had not browned, so I should have cooked it longer. Duh! I was trying to do too many things at one. Oh well! Please…..can someone help me with Lemon Bars?? I have made at least five, maybe six different recipes for Lemon Bars and NONE were any good!!!!! The shortbread has always been good but the lemon mixture is gummy,thin and just terrible. I appreciate any and all replies. Oh man, these were delicious! My Dad loves lemon so I made these mainly for him…but the entire family ended up loving them as well! Definitely will be making these bars again! Lemon & custard flavor give a perfect balance of sweet and tasty desert. Well, I made them, and I liked them. Grating the butter was such a greasy, messy hassle, and I think you can get the same effect just cutting in the butter. I definetly will not grate butter again! But they did turn out excellent! Everyone enjoyed them, and I really liked them too (first time eating a lemon bar). I might tone down the lemon flavour slightly next time, for my family’s palette, but thats pretty much the only adjustment. 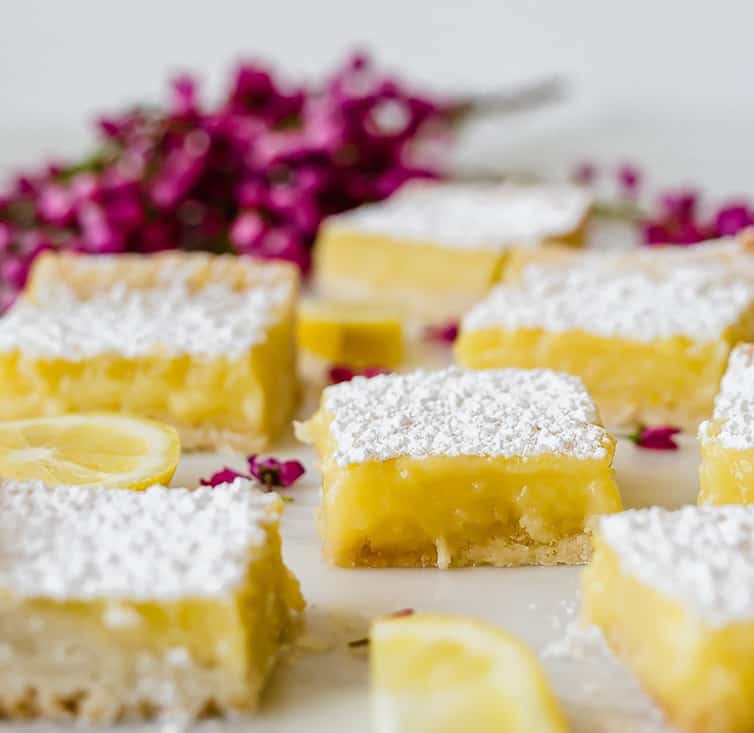 I love lemon-y desserts, these bars look perfect. Yumm! I know what you mean… I’m a coconut convert. Two years ago I wouldn’t touch it, now I can’t get enough. These bars look great… I had a lemon bar failure a few years back and have never tried again. These might do the trick though! LOVE LOVE LOVE Lemon bars!! !